Former American rap tycoon Marion "Suge" Knight has not responded to a charge of voluntary homicide for a hit and run incident in 2015. 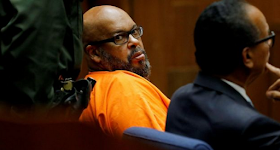 The founder of Death Row Records made the statement to avoid charges of murdering a man and attempting to assassinate a second with his pick-up truck in Los Angeles. His record label helped launch the careers of artists such as Dr Dre, Tupac Shakur and Snoop Dogg. The 2015 incident occurred after a discussion about the creation of Straight Outta Compton, a biopic about the NWA rap group.